This delicate emission nebula is located in the constellation of Canis Major at a distance of about 15,000 light years. The nebula is illuminated by a central star in its last stage of life. This is a massive so called Wolf-Rayet star which is shedding its outer layers of gas at an extremely high rate due to intense radiation pressure. Wolf-Rayet stars are thought to represent a brief stage of evolution near the end of life for giant super massive stars - the last unstable phase before the star explodes as a brilliant supernova. 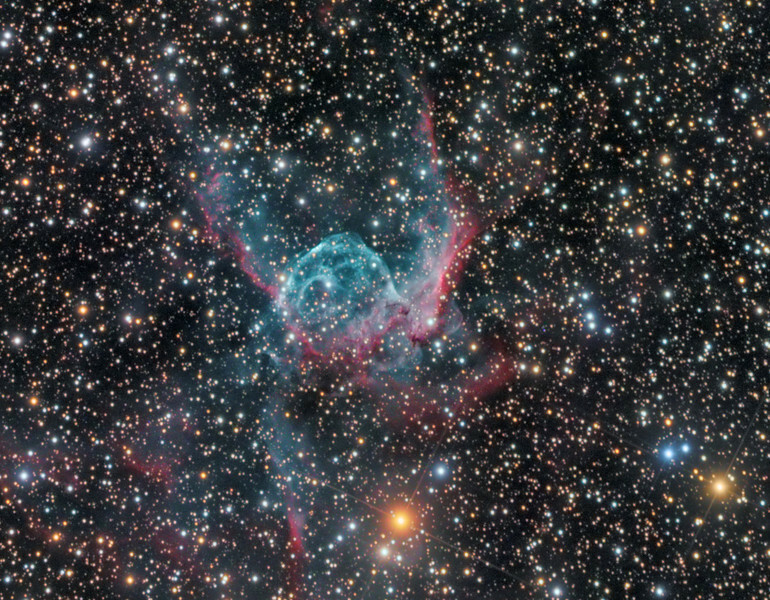 In the case of Thor's Helmet a large expanding bubble has formed around the bright central star. Interaction with giant molecular clouds in the area have contributed to the overall intricate shape of the nebula and large bow shock structures radiate out from the bubble in several directions. The nebula is some 30 light years in diameter and the strong blue-green colour is due to OIII emission near the star. This entire spectacle lies embedded in a dense star field consisting of thousands of coloured jewels each casting their own contrasting light onto this dramatic interstellar scenery.